CAMP BUCCA, Iraq - For some, the memories of growing up with siblings can be bittersweet. One rule was a constant: you took care of each other, no matter what. This is the creed by which brothers Franklyn and Spencer Gomez have lived by their entire life, and has now taken on a new meaning here in Camp Bucca, Iraq. Brothers Spc. Franklyn (l) and Spc. Spencer Gomez joke around on the roof of a building at Camp Bucca. They rely on each other to get through the rigors of deployment. According to their mother, Nury Gomez, the Army-like discipline she instilled in her boys was necessary to keep them safe. “We were a small family, it was just the three of us… and ever since they were little, I always taught them to take care of each other,” she sighed during a phone interview. Now alone at her home, Nury still supports her sons’ decision to join the New Jersey National Guard. “I’ve always liked the military… and they’re boys who know good from bad, and I will always support them in their decisions,” said Nury. She has never wavered in her support, not even when she heard the news her sons, and only family in the United States, were being deployed to Iraq at the same time. Both brothers were originally assigned to the same company, Headquarters and Headquarters Company, 2-113th Infantry Battalion, both hold the same military occupational skill and rank, supply specialist and specialist. Their deployment has changed their career unison. Franklyn is now assigned to Charlie Company, 2-113th Infantry Battalion, as a detainee guard. 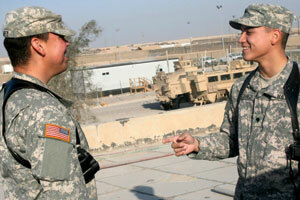 Spencer remained in HHC, filling his older brother’s shoes as the lead supply specialist. They work opposite schedules. Spencer works day shift, while Franklyn has become a creature of the night. However, their biggest challenge is not working with detainees or endless property inventories. Spencer’s biggest challenge has been uncertainty. “The hardest part is not knowing what’s going on at home all the time,” he said. In spite of their challenges, both brothers have soldiered on, and lean on each other for support. “My brother makes me feel like we’re back at home,” Spencer said. “I see him two or three times a week, and instead of talking about work, we play [Nintendo] Wii or talk about random stuff,” he added. Their mother, thinks this deployment will be a good experience for all of them. Bucca on Feb. 5. 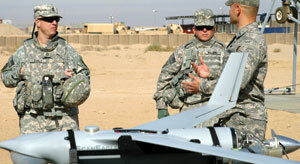 The base defense mission, to include the command and control of the UAVs, is led by Headquarters, 2-113th Infantry Battalion. U.S. Army photo by Maj. Jason Fetterolf.